The management of drain sludge (faecal sludge from sanitation facilities) and effluent is a crucial link in the public health protection chain. An uncontrolled discharge has adverse effects on human health, living conditions and the natural environment. Latrine sludge and effluent produced by families can only be stored temporarily in individual or public sanitation systems and therefore must be evacuated to unloading sites or sewage treatment plants. This removal can be accomplished through regular emptying, as in the case of latrines with one or more pits which, once full, have to be emptied (2 to 4 times a year for public latrines, once or twice a year for private latrines). The alternative is to continuously discharge wastewater into a sewer system. For a long time, all human excreta were discharged directly into the environment. The problem of latrine sludge and effluent removal was first raised in urban areas and then in rural areas for health reasons. The first solution used was to empty such waste and then transport it manually in tanks. Although this means is still widely used, it has been improved through the use of motorised pumps and tanker trucks. The construction of sewers used to collect and dispose of all wastewater is a more recent technique that can only be introduced gradually because of its high cost of investment. The removal of latrine sludge and effluent concerns all families and public places that do not have a self-contained sanitation system, of the septic pit type. The processes involved are varied as they relate both to the removal of latrine sludge and all wastewater as well as individual and public sanitation. The choice of the most suitable process must take account of the wastewater treatment method used, local access and service conditions and the financial resources of inhabitants. There are several processes for removing and transporting sludge and the various methods can be classified according to the following two main categories. The first category, corresponding to an on-site removal and the transporting of sludge in tanks, is suited to an individual sanitation system. It is used to empty the sludge of latrine pits or toilets. The second category allows wastewater to be removed remotely through a more or less elaborate sewer system and involves the use of a semi-public or public sanitation method. - Entirely manually using shovels and buckets to fill a tank, which is the most basic solution, suited to the emptying of dry sludge but which involves significant health risks for the operator. - Using a Gulper type manual pump, which is a significant improvement. A Gulper pump consists of a rod with two valves inside a PVC pump housing. The valve system, operated by the operator, pumps out the sludge which flows into a bucket in an inverted V-shaped spout. Another solution available on the market is "MAPET" (Manual Pit Emptying Technology) which is a hand pump connected to a tank. 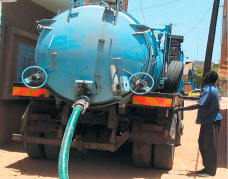 Whatever the emptying method used, the sludge is collected in a tank placed on a cart and then transported outside the district to be discharged into a transfer station or to a treatment centre. The tank volume is limited by the weight that can be pulled by an animal (donkey, ox or other) or a coupled tractor according to the transport method selected. The distance to the discharge location is the limiting factor as transport is manual. This process is similar to the previous case, but the hand pump is replaced by a motor-driven pump. The advantage of this solution, which is suitable for the liquid or viscous sludge present, is that it can quickly drain a pit with no health risks for the operator. UN-Habitat has a more elaborate, single-piece emptying and transport system called Vacutug, which has a tank and a motor-driven vacuum pump. Its small size allows easy access to sludge pits. It can also be provided with a small motor for transport. The sludge is then removed by emptying trucks or other vehicles equipped with a vacuum pumping system and a storage tank for drawing out and transporting sludge and wastewater. The capacity of a emptying tanker truck is between 3,000 and 10,000 litres. The emptied sludge is then taken to unloading centres located outside the town or away from neighbourhoods, or to treatment plants. Sludge that is too dense and cannot be pumped out has to be diluted. When access by truck is not possible, the Vacutug system (see above) available from UN-Habitat provides a more compact emptying and transport system including a 500 litre tank and a vacuum pump. This removal method involves installing small diameter pipes connected to each household in a group of houses. All the wastewater from each family has to be connected to the sewer to provide for gravity flow at a sufficient rate, requiring specific toilet equipment in each household. The mini sewer system is then connected to a treatment plant or a main sewer. 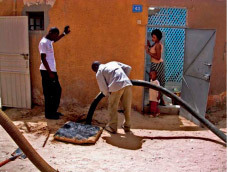 The mini sewer system is an alternative to the construction of a main urban system. It is easier to build and less expensive as the smaller pipes are often less deeply buried. Mini sewer systems can be of a simplified type and then receive all discharged water or may be preceded by a settler-degreaser and then only receive the liquid portion of discharges. This process is the most elaborate infrastructure for wastewater disposal. It is used on a widespread scale in developed countries, and is also used in some urban areas in developing countries that generally already have a drinking water supply system. It is implemented using pipes of various diameters, sometimes over very long distances, depending on the flow of effluent involved. This allows household wastewater and rainwater to be transported by gravity or, if necessary, through the use of pumps. The required infrastructure is significant and costly. In addition, municipal sewer systems have to be connected to a treatment plant before discharge into the natural environment. Each category has specific problems. Manual emptying, even using a pump suited for this purpose, involves health risks that require the taking of essential safety precautions. The use of a motor-driven vacuum pump is recommended. If there is a mini sewer system, the main problem is the risk of pipes being clogged by solid matter. It is therefore recommended to include a pre-treatment system to separate liquids from fats and solid matter. Only grey water and the liquid portion of black water are then removed. 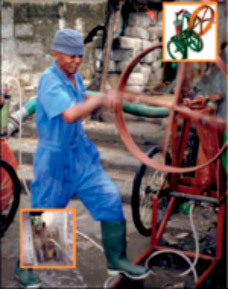 Although the advantage of manual removal of sludge is that it is inexpensive, it requires operators to work under difficult conditions involving high health risks. The most important aspect in manual emptying is to ensure that workers are well protected with gloves, boots, overhauls and masks. Medical examinations and vaccinations should be regularly provided. When access conditions permit, the use of motor-driven tanker trucks represents significant progress, but at a higher cost. The installation of sewer system receiving the wastewater from each household and connected to a sewage treatment plant is the most comfortable solution. This solution is already largely widespread in developed countries and is beginning to be used in large towns worldwide. The installing of a sewer system in a large town that does not already have one is an operation that is technically difficult and very expensive. Work can only be done gradually. The installation of mini sewer system may be a cost-effective alternative. In the case of a mini sewer system, the investment cost is about €200 to €400 per family and the cost of maintenance ranges from €15 to €30 per year and per family. When homes are connected to a main sewer system, they are usually also connected to a drinking water supply system. In this case, families must pay a fee based on the volume of water consumed. This price includes maintenance costs and, according to the national policy, all or part of the writing off of building costs. The process must be suited to local conditions which vary greatly according to the type of housing, the sanitation facilities available to families and their financial resources. Manual transport by tank wagon is suitable for areas that cannot be accessed by an emptying truck either because the streets are too narrow or because such services are not available or are too expensive. However, it is only possible when the sludge discharge site is not too far away. Without a sewer, the motor-driven transport by truck solution is the one most recommended. The installation of a mini sewer system is a cost-effective solution for a group of houses in an urban or suburban area that already have household access to drinking water. It is recommended to given priority to the prevention of health risks for operators. The recommendation begins from the design of pits or latrines that should be able to be emptied under good conditions. Several countries have installed condominium sewer systems. These are mini sewer systems connected to a housing block installed in the private portions of houses. The system is then considered as a private infrastructure and has to be financed and maintained by the residents. As long as they are well trained and willing to get involved in managing and running the system, the system allows considerable savings, compared with a main system that is sometimes very complicated to build. Originally intended for low-income communities, this model is now the standard for urban areas in Brazil and has been adopted by several countries in Latin America and Africa. 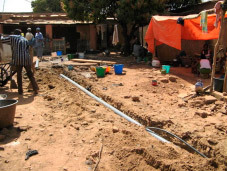 In Senegal, it has been shown that the small diameter sewer system was a preferred option for small communities of up to 5000 households. - "The Compendium of sanitation technologies" is a publication presented as fact sheets on all technical aspects of sanitation. - PS Eau : This article focuses on sanitation in developing countries.